Something extraordinary happened Wednesday: the titans of the U.S. and Chinese tech industries posed, class-photo style, with the president of China. 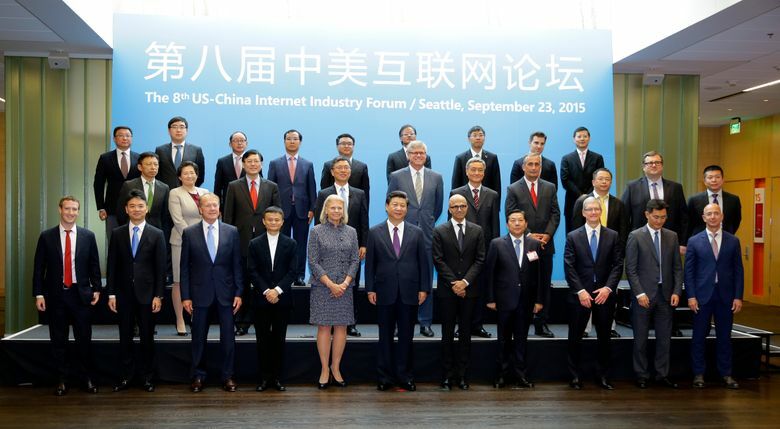 The occasion: Xi Jinping stopped by Microsoft for a tour to mark the conclusion of a part-diplomatic exercise, part-business talks, Internet industry forum. Second row: Zhang Chaoyang (Sohu CEO), Lisa Su (AMD CEO), Yang Yuanqing (Lenovo CEO), Harry Shum (Microsoft executive vice president), Steve Mollenkopf (Qualcomm CEO), Xiong Qunli (CETC chairman), Brian Krzanich (Intel CEO), Zhou Hongyi (Qihoo 360 chairman), Reid Hoffman (LinkedIn chairman), Cao Guowei (SINA chairman). Third row: Li Jun (Sugon CEO), Cheng Wei (Didi-Kuaidi CEO), Tian Suning (Broadband Capital CEO), Liu Liehong (CEC president), Zhang Yaqin (Baidu president), Jerry Yang (Yahoo! founder, AME Cloud Ventures CEO), Sun Pishu (Inspur CEO), Brian Chesky (Airbnb CEO) Shen Nanpeng (Sequoia Capital partner). The photo, taken in a nondescript room in Microsoft’s Redmond conference center, was just as remarkable for the interactions it spurred. Mark Zuckerberg, the chief executive of Facebook (a company essentially blocked from doing business in China by Internet regulators) spent about a minute speaking to Xi in Mandarin. Executives down the line delivered scripted-sounding, formal thanks to the leader of the world’s most populous country. Companies like IBM, AT&T, Hewlett-Packard, Intel and, ultimately, Microsoft, made the U.S. the locus of the high-tech business in the 20th century. Based on the attendance for what was essentially a photo-op in Redmond, that tech industry is betting that their future relies on China.